Shop for authentic Mississippi Flags. 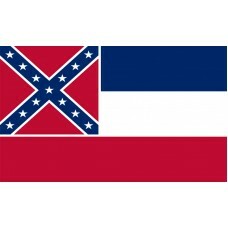 We offer indoor and outdoor Mississippi flags in durable nylon. Our outdoor flags are finished with a canvas heading, while indoor flags are finished with a lined pole hem and your choice of with or without fringe. We also offer indoor and outdoor Mississippi flag sets. The Mississippi State Flag features three horizontal bands in the colors of blue, white, and red. In the top left-hand corner of the flag is a red square that has a blue saltire (diagonal cross) with a white border and thirteen 5-pointed white stars inside the cross. The colors used on the flag are the same colors and shades that are used on the flag of the United States of America. The cross is the Southern Cross and the thirteen white stars inside the cross represent the original thirteen colonies of the United States of America. The Mississippi State Flag was adopted on April 23rd, 1894. Mississippi is a state located in the Southern Region of the United States of America. It shares borders with Tennessee, Alabama, Louisiana, and the Gulf of Mexico. The capital city is called Jackson. Mississippi is also known as "The Magnolia State" due to the number of magnolias and trees that can be found here and the magnolia is the state flower. The original Mississippi State Flag was also known as the "Magnolia Flag." Mississippi's name is derived from the Ojibwa word "misi-zibi" which translates as "Great river" or "Gathering of water." The first inhabitants of Mississippi were Native American tribes and Paleo-Indians who were hunter-gatherers. The main tribes included the Chickasaw, Choctaw, Natchez, as well as the Yazoo and Biloxi. The first European to visit the area was Spanish explorer Hernando de Soto in 1540 on his second journey to find the New World. He was also the first European to reach the Mississippi River, which he named "Rio Del Espiritu Santo" which translates as "River of the Holy Spirit." Hernando de Soto claimed the area for Spain. A century later, French explorer La Salle, claimed the area for France and in 1699, the French established the first European settlement at Fort Maurepas and in 1716, they founded Natchez, which was the main, dominant town. During the 18th century, Mississippi was ruled by the Spanish, English, and the French and a lot of slaves were being imported to the area by the Europeans. Following the French and Indian war, the British gained control of the area until 1798, when it became a territory of the United States of America. The city of Natchez was originally the capital of Mississippi until it was changed in 1822 to Jackson. On December 10th, 1817, Mississippi officially became the 20th state of the United States of America. Mississippi is home to the famous Mississippi River which is the largest river in the United States of America and one of the major river systems in the world. The river lies in ten states which include Minnesota, Wisconsin, Iowa, Illinois, Missouri, Kentucky, Tennessee, Arkansas, Mississippi, and Louisiana and is often referred to as "Old Man River."